Installation is easy: simply mount the evaporator high in the box, connect the pre-charged plate and compressor, and connect power. Converting your old ice box into a modern refrigerator has never easier. Once installed, the age-old hassle of hauling ice will be over! Isotherm specializes in dependable, energy-efficient systems which are backed by the exclusive Isotherm 5-year warranty on all compressors so you'll have the confidence of knowing you have purchased the best! Isotherm ASU charges the holding plate while the engine is running. The patented ASU system has now been available for more than 30 years and has been installed on tens of thousands of boats worldwide. The ASU system starts the compressor when the engine is running and the power is available to freeze the holding plate completely. The energy stored in the holding plate will keep the refrigerator cool for many hours. When the engine is stopped, the compressor will not restart until the cold stored in the plate is all consumed. Once the stored cold is completely consumed, the compressor starts to run for short periods to maintain the required temperature in the box. 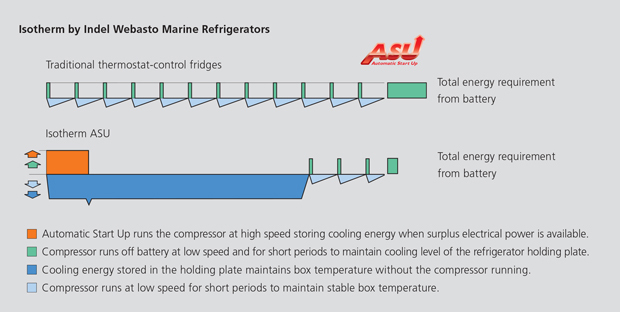 With its unique principle of operation – the patented ASU “Automatic Start Up” system – Isotherm ASU has an important competitive advantage over traditional refrigerators. 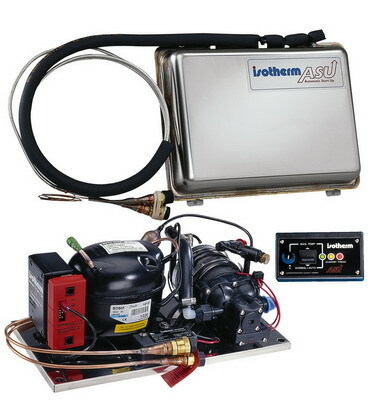 This unique system is designed to start the compressor up to 75 % of its performance mainly when the engine is running and plenty of power is available. Using a powerful compressor (a three-phase compressor with full-range speed control) is highly recommended as it achieves a quicker freezing of the holding plate. By taking advantage of the surplus energy generated by the alternator when the engine is running, the ASU feature does not reduce the engine’s effectiveness. Max. Box Volume Fridge (Cu Ft.) 8.5 Cu Ft.
*Power consumption figures for comparison purposes are listed as the amps consumed when running / average hourly consumption on 12 volt system with 42°F in the refrigeration space, ambient air temperature 72° F. and medium sized insulation. ** Refrigerator temperatures from mid-30's to mid-40's are proper refrigerator temperatures. Reduce the box volume by 10-20 %, in tropical conditions. Dual can operate both as a fridge or a freezer by setting the temperature with a special thermostat. Specification changes may be made without prior notice.